A year ending in an odd number means that the top international stars rest this summer. There is no rest for the lone star of 55 Football Nations as there are 12 summer leagues to cover. 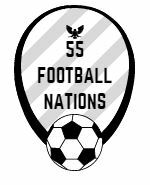 55 Football Nations kicks off in Georgia in June. Hi Ben, the Russian fixtures have yet to be published for 2017/18. I’m planning on watching either Rubin Kazan or FC Ural Yekaterinburg (should they retain their Russian Premier League status). There are four Moscow teams as a safe cover option should neither Kazan nor FC Ural be at home.